If you want to learn piano, you need to practice the authorised lessons of an highly qualified teacher. If you think you can start composing piano concertos in your first few months, you will fail. Similarly, if you want to become a competent cook, you must follow recipes, constantly, regularly, until you become very experienced. When you reach a steady level of competence, then, and only then, should you make up recipes. If you do, those made-up recipes will be based on sound kitchen principles. I know that some of you will not agree with this perspective. 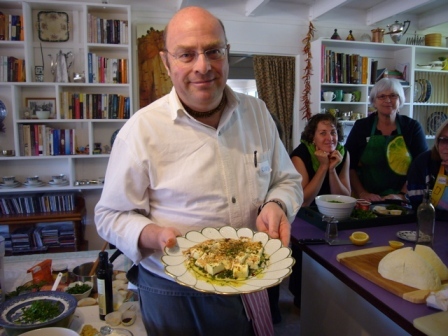 I meet many such persons at my cookery classes who admit to never following recipes. Okay, they may pull it off sometimes, but sometimes they will fail. And their cookery may never be extra-special. Ok, I guess you are not surprised in hearing this viewpoint, since I write cookbooks. Some people are incorrigible speculators, and you can’t teach an old kitchen dog new tricks. But I sincerely offer this advice to any beginner who really wants to become an expert cook. Yesterday I whipped up a quickie for breakfast with what immediately was in arms reach in the kitchen. There are no exact amounts, but as explained above, if you understand the principles of cookery, you can (as I did) write a recipe on the spot. I toasted a couple of slices of my homemade sourdough bread. Then I heated a tablespoon of olive oil in a wok, and dropped in a couple handfuls of cubed organic tofu. After the tofu turned a little golden on it’s edges, I sliced up a couple of Bequinho chilis (see yesterday’s blog) and tossed them in. Then a sprinkle of yellow asafetida, followed by a generous grinding of mixed peppercorns (freeze-dried green, pink, and black Malabar). On top of that I threw in two very ripe, chopped organic trellis tomatoes, and allowed them to break down a bit. Finally, I chopped some fine stalks of fresh coriander (I had used the leaves the day before), a smidge of raw sugar, a trace of ground black salt and some ground rock salt. Onto the toast, some chanting of Vedic hymns and the famed Maha Mantra to sanctify the offering, and it was ready. Very simple, of course, but very nice. 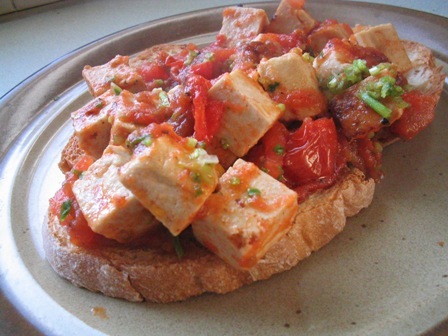 You could replace the tofu with panir, or baked ricotta, or haloumi. Cooking breakfast can be a great pleasure, especially if you can get yourself in a joyous, appreciative frame of mind. Then the eating part can be all the more rich and rewarding. Yum! !